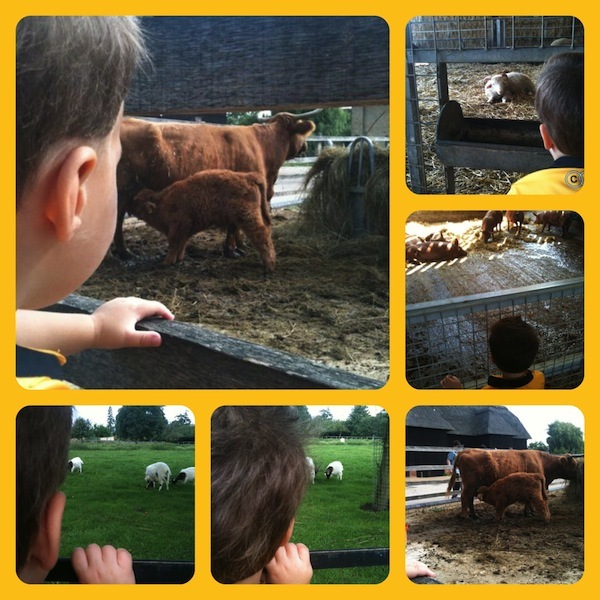 We love the fact that we live so near to the National Trust’s Wimpole Home Farm near Cambridge. We’ve been several times since we’ve had kids (and a couple of times before!) and we never get bored of it. The Wimpole Estate is a large area of land with a mansion house and a working farm with animals that are reared for milk, meat, eggs and wool. There are also extensive grounds that you can wander around and picnic in. The last time we went was the August bank holiday Monday, which was a lovely warm day and we had a wonderful family morning out before Daddy had to go to work in the afternoon. We arrived early and ours was one of the first cars in the car park, so we bought our tickets and wandered around a bit by the entrance to the farm until it opened. As National Trust members we still have to pay to get into the farm, but is is much cheaper than the standard ticket and well worth the price for a good value family day out. An excited Andrew was looking forward to seeing the animals, so as soon as the gate opened he steamed ahead on the path down to the farm. As we approached, we stopped to see the donkeys and goats in the first field by the reception. The first thing that Andrew spotted once we were actually inside was a tractor that you can sit on and pretend to drive, so he and Joel had a turn on that together. 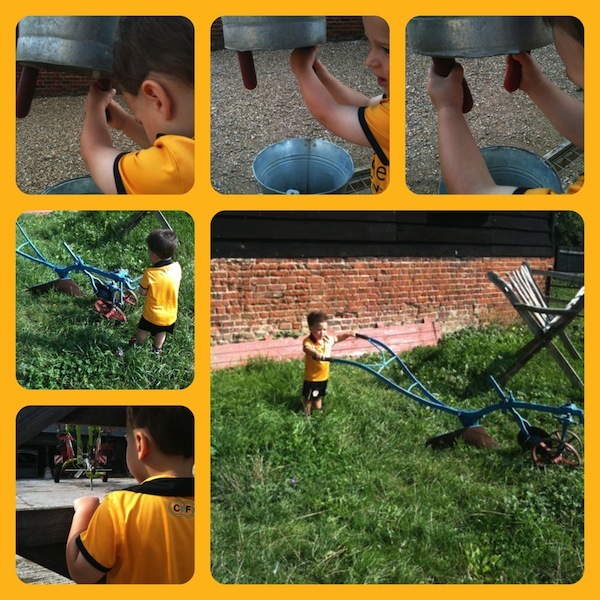 We also stopped to watch a baby cow having its milk from mummy, and then Andrew had a go at ‘milking’ using a milking simulator – a couple of cow sized teats hanging off a bucket of water! Next we went over to say hello to the shire horses, which were inside the stables at that point, but they also come out to do cart rides that visitors can hop on to. There were some turkeys in the stable too, next to the horses, which Andrew found very amusing, maybe because they were down at his level and he could wave to them. I think too that he hasn’t made the connection between turkeys like this and the turkey that we eat sometimes. 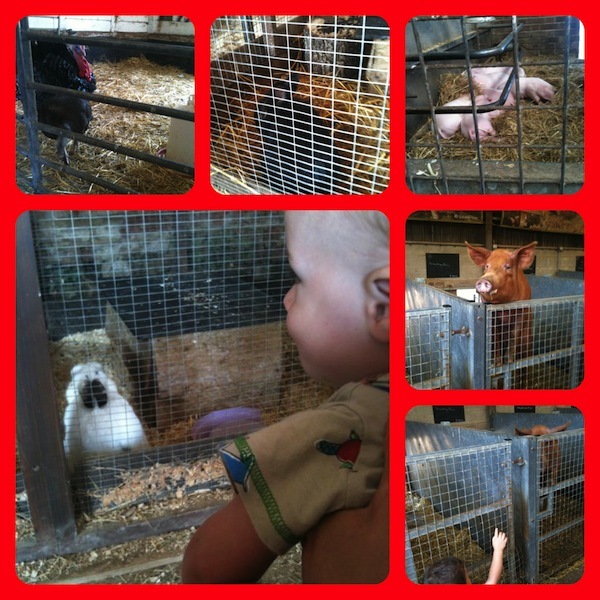 Joel enjoyed looking at the rabbits that were across the courtyard on our way over towards the pigs. Soon it was time to watch the pigs being fed, so we headed over to the pig sties and stood there while other visitors congregated in anticipation of the feeding session and the pigs got very excited. But nobody official turned up with the food for a while, and Andrew needed the toilet, so while he and Daddy went off, Joel and I waited and eventually saw the pigs being fed. There was a range of ages of pig, right from little piglets to teenage pigs to mummy pigs pregnant with litters more babies! 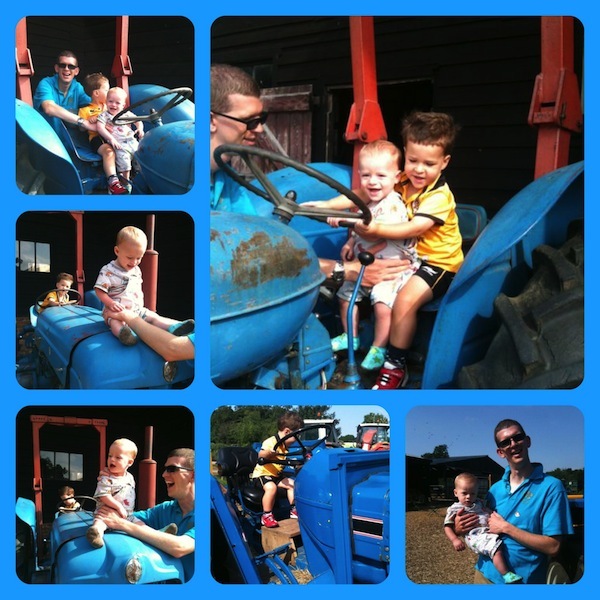 The next thing on Andrew’s radar was the small playground (shaped like a combine harvester) and the toy tractor maze – ride on tractors that you can drive around a small maze of hay bales. 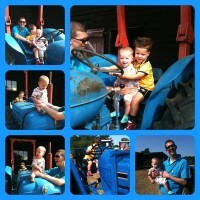 We spent quite a while there, and Joel enjoyed being pushed around on a tractor too. Then we headed to the bigger adventure playground that is tucked away in a wooded bit. It was still very empty at that time, so the boys had a good go on it without the busyness that I’m sure it would have had later on in the afternoon once more people had got that far. Having expended a lot of energy climbing, sliding, swinging, running and more, Andrew in particular was getting very tired and we knew that Daddy had to be in work fairly soon, so we started to head back to the car, stopping by some more paddocks of animals (mainly sheep and chickens) on our way, waving to the inhabitants as we passed. As always when we visit Wimpole, we had a fun family morning out, and we’ll be back again another time to do it all again. I can definitely recommend this as a great way to let babies and toddlers experience farm animals in a family-friendly setting. It’s also good for slightly older children to learn where certain foods come from, rather than just ‘the supermarket’! One of the benefits of getting there early is that it looks like you had the play areas to yourselves. 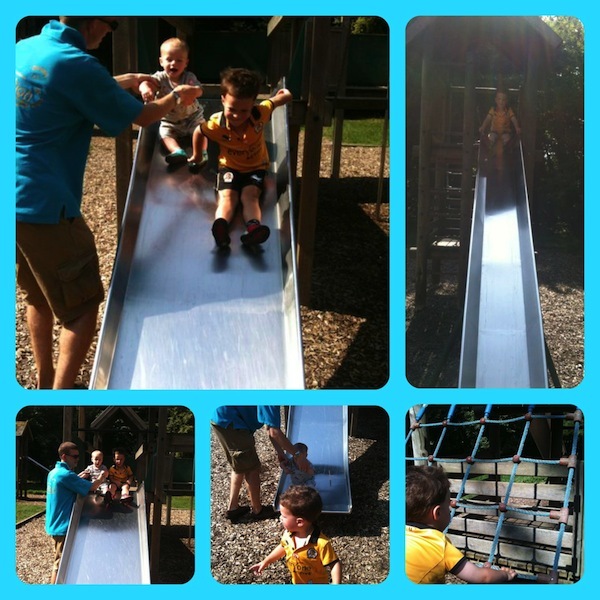 What a great morning of family fun, the photos show what a happy time the boys had. Thanks for linking up and sharing with Country Kids.